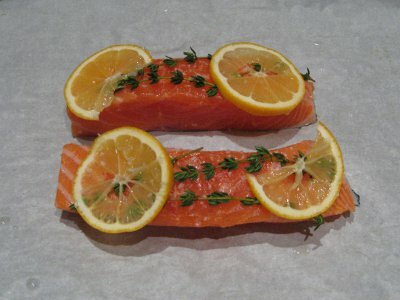 I received a special request from a friend to post a salmon recipe, here it is! A super easy and quick way to prepare salmon, I am not even sure it can be classified as a recipe! Because salmon has an intense flavor I decided to make it using very few ingredients. Also I chose to bake it in a cartoccio to avoid the salmon smell in the house. Put in the hot oven and cook for 15 to 20 minutes. Be careful when opening the cartoccio as hot vapor will come out. Serve with cooked vegetables or salad. Your friend must be a very distinguished person for requesting such a wonderful recipe.